These addition worksheets, loaded with colorful illustrations and inviting themes, will have your kindergartner asking for more! Kids can colour, count, and add everything from footballs and fish to vegetables and pirate booty as they gain valuable skills practise adding within 5, 10, and 20. Throw in some practise with number bonds and simple word problems to help maximize your child’s addition confidence. 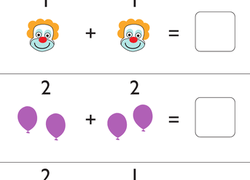 This worksheet will ensure that your kid gets plenty of practise adding with a number line. Kids practise adding single-digit numbers and writing the sums on this sports maths worksheet. Use this super-powered worksheet to help your students break apart numbers. They will love filling in the missing numbers to make each equation true. 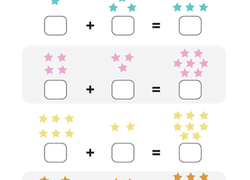 Go over addition and subtraction facts up to 10 with your kindergartener with this nifty practise test. 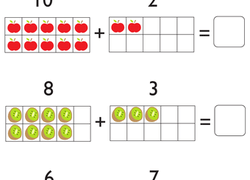 Kids practise adding numbers with addends up to 10 and writing the sums on this fruit-themed year one maths worksheet. Adding two numbers? Too easy. See if your year one maths whiz can add three! Count the number of vegetables in each box to find the answer to each of the addition problems. Time for a prehistoric maths lesson! This worksheet gives your kid the opportunity to practise a few basic addition skills while counting triceratops. Year one students are becoming better at adding numbers every day! 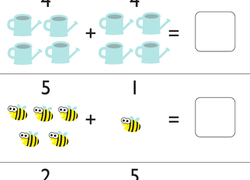 Help them understand what happens when you add one more using this fun worksheet. This worksheet helps kids practise addition within 5 by asking them to count animals!